Since its inception in 1977 when Pauline Tsui and Ambassador Julia Chang Bloch had a cup of tea at Julia’s house and later joined by Jeanie Jew, a dream became a vision of three women who took different paths to achieve their goals. Julia pursued public service, Pauline organized a group of women together, and Jeanie Jew conceived an idea to honor the contributions, concerns and histories of the Asian Pacific Americans. These building blocks have all made their journeys coming to successful ends. Julia became an Ambassador, Jeanie’s idea has become a 20-plus year-old annual event named the May-Asian Pacific American Heritage Month, and Pauline established the Organization of Chinese American Women (OCAW). 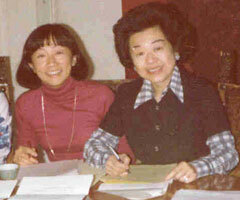 OCAW, a group of dedicated Chinese American women, including a number of prominent women who are serving and have served in the various administrations in the nation’s capital, has a tremendous amount of talent, imagination, and skills helping to find solutions to some of America’s problems and assisting our own communities in their many endeavors. The leadership and community services demonstrated by OCAW members are exemplary. Through good works and volunteerism they have given much and touched the lives of many. OCAW is a national non-partisan, non-profit [501 (c) (3)] organization with headquarters in the Greater Washington, DC Area. It is supported by membership, private donations and public grants. Contributions to OCAW are fully tax-deductible. Membership is open to those who support the purpose of the organization. OCAW is not associated with any foreign government.